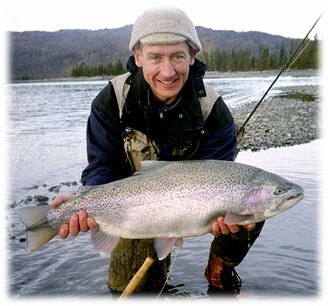 Trophy Kenai River Alaska Rainbow Trout Taken on Flyrod! George R. Krumm was handsomely rewarded with this fine specimen of an upper Kenai River rainbow on an October fly fishing trip. Warm weather and lack of ice extended the comfort zone for fall diehards like George who know that the time just before freezeup is when the biggest of the trout are accessible. This fish measured 31.5 inches in length and 21.5 inches in girth and pushed the 20 pound mark. After this quick photo it was released to fight another day. George was using a 9'6" 8 wt. custom built rod he made, a System 2M size 8/9 reel, 11' of 8# Stren fluorocarbon; no taper, no indicator, and lastly a hand-tied Illiamna Pinkie on a #8 Gamakatsu glow bug hook. This fish also qualified for the AOJ Sportsman Hall of Fame gallery as an exceptional monster rainbow.